Let me find the Right Agent for You! It is my passion to connect people with agents who actually specialize in what you want. Give me a few minutes of your time and I will find an agent perfect for you. Don't work with someone who isn't an expert in exactly what you are looking for! Maximize Space Remove oversized furniture and replace what you can with a smaller alternative. Minimize Clutter Clutter can be a definite deal-killer, so get it out of your house! Clear off countertops, office areas, living areas, and especially kids rooms. When trying to sell your house, remember that less is always better! Remove Personal Belongings Take down family photographs, artwork, etc... you want your home to be a place where nearly anyone can envision themselves living. Make Cosmetic Changes A little paint can go a long way and refresh almost any room. Take advantage of fixes you can make easily around the house yourself. Don't forget to touch up the areas that may have been scuffed or damaged. Your eyes may be used to the imperfections, but a buyer's won't. Hire a Professional Home Stager If you leave it to the professionals, your house can be transformed into ways you've never imagined. Our favorite interior designer, who also specializes in Seattle home staging, is Craig Williams Interiors. Put your home in Craig's hands and you will can cut the time it sits on the market and also maximize profits. We have another blogging project that focuses on negotiations. Everyone negotiates! Whether it is a parent with their children or a couple deciding were to go out to dinner, everyone is involved in negotiations on a daily basis. And yet most Americans have a negative connotation of negotiation. It is pride really. If we have enough money we wouldn't have to negotiate. Or we think that negotiation is more like pulling to wool over some ones eyes than coming to mutually beneficial agreement. Well we want to change that. We believe that anyone can be a good negotiator, it just takes a little practice and planning. That is where The Negotiation Board comes in. It is a forum and a Blog. The Forum is a venue for anyone to share their negotiating stories and ask questions on how to handle certain situations. The blog is for tactics and strategy discussion. Our hope is to create a community that is supportive of each others desire to improve their negotiating skills. A community dedicated to helping each other save money and reach mutual beneficial agreements with others in our daily lives. We are just getting started but already have some great posts about getting out of a Verizon wireless contract and even one about negotiating with Comcast. We have a significant amount of tactics and skills information and training already available. We would love to have a few guest posts from Realtors, who are expert negotiators, sharing a few of their better real estate negotiation stories. If you are an agent and would be interested in writing a guest post or two, check us out over at The Negotiation Board and let us know. I DON'T need to know the area to be your Real Estate Agent! After my last post here is a comment I received from a Realtor. I like to think that it's less about the area that I know but the fact that I know negotiation and contracts very well. On top of it, my clients are usually tech savvy and want someone that communicates in the way that they do. Having come from a technology background I am able to do just that. The majority of my business is in King County, but I also work in north Pierce County and south Snohomish. This is EXACTLY what I have been talking about, the average real estate agent specializes in making the commission not serving their clients. Every real estate agent had better know the contracts and how to negotiate, that is a given. But to say that you don't need to know the area to best serve your clients is false. I often hear that the value of a home (or any asset for that matter) is whatever a buyer is willing to pay for it. Real Estate Agents often use this to rationalize not knowing the area they are working in. "If my buyers are willing to pay X for this property then that is what it is worth." NO, that is how the listing agent is supposed to think, Not the agent representing the buyer. A Salesperson has this definition of value, not an agent. And agent is someone who represents the interests of their principle, not a salesperson. Are appraisers supposed to set the value of a home at whatever price an individual will pay for it? No, just because someone is willing to pay 500k for a 200k home doesn't mean that appraiser will value the home at 500k. Ok, sure there are appraisers who are just as unscrupulous as some realtors and lenders, but let's stick to what they are supposed to do. The value is what the home will sell for in a specific market not to a specific individual. How can a real estate agent who hasn't walked the last 20 similar homes that have sold recently know what the value is? They can't! Sure they can come up with lots of great rational why they can: look at the MLS history, tax assessed value ratio, neighborhood analysis, Zillow, experience, technology, and of course the best "It is worth whatever their buyer is willing to pay." Agents like this are a part(just a part) of the reason we are in the financial trouble we are in right now. They don't represent their clients, they just sell them what ever they can and for whatever price they will pay. I refer people to agents who specialize in an area. Sure they may work with people outside of that area, but that is the exception not the norm. Buyers and Sellers need agents who know the local market and have walked the homes that have sold. It is the only way they can really understand the value of a home. I know and work with local agents who specialize in an area and act like an agent is supposed to, they represent their principle YOU! If you are looking to buy or sell a home in Western Washington, let me help you find the right agent for you and the area you are looking in. Becoming a Referring Only Agent? Ok so just how is this going to work? Part of the reason I am phasing out of full time Real Estate is that I don't want to work with unscrupulous people. No not all agents and lenders are unscrupulous! But, unfortunately,I think there are more that are than not. Just look at what attracts most people into the real estate industry. $$$$$$$$ Making money fast. People are lured into Real Estate thinking that they are going to make it rich. Brokers tell prospects about how much their top performers make to get them to sign up. Then over 90% of agents drop out in the first 2 years. It isn't all that easy to make a sustainable income. Being a great agent takes a lot of work, it definitely isn't a walk in the park. I will admit that is what attracted me to the business. I thought that a flexible schedule and a decent income would allow my wife to stay home when we had kids and I could spend more time at home with them. I want to be really involved with my family. 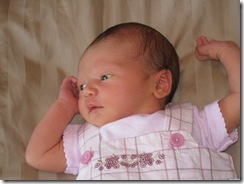 We had Callista a few months ago. She is a beautiful gift from God. Even her cry's and screams are cute. Real Estate Riches are made working long hours, nights and weekends. Not for the family man wanting to spend more time at home. I have been double dipping for awhile now working for a marketing company in Auburn, more of a 9 to 5 gig. Working B2B is great, much less likely to be stuck working with those unscrupulous fellows. I want to keep what I like from the Real Estate Industry. I am going to reduce my night and weekend work and just refer clients to other great agents. One thing I have learned in the business is what smoke smells like. No matter where they try to blow it. This way I can send clients to agents who actually specialize in what they are looking for. I've represented buyers, sellers, houses, townhouses, condos, Snohomish/King/Pierce counties, wherever there was a commission check I was. Sure I did my absolute best for every client that I had. But specialization has its benefits. There was no way I could've really known the inventory in Tacoma and Bellevue, only an agent that specialized there could. Someone who actually went on tour every week and saw every home that came on the market. Most agents are just like I was, they specialize in making the commission check. That is what brokers teach their agents to do. Make them money! So instead of spending my time knocking on doors and sending out massive amounts of postcards, I am going to get to know great agents. This way I don't have to work with the unscrupulous ones, I can just say no. Then I can review these agents here on this blog. I can talk about what they do great and only write about agents that I feel actually have their clients best interests in mind. No Smoke Allowed! When I am approached by a person who is looking to find an agent I can then send them to the agent who will best serve them, not just someone chasing the commission check. Sure I wont make as much as a full time agent, but this is only a part time gig. I can focus my time on my family and working at my marketing gig. I can take what I love about real estate and help others at the same time, the best of both worlds. Wish me luck as I figure out how all this is going to work. 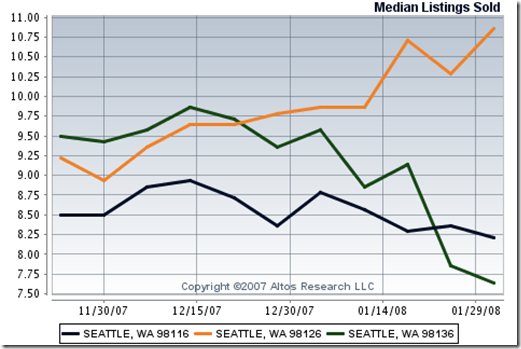 I talk a lot about West Seattle Real Estate, mainly because it's where I live. I would be happy to provide them to you. 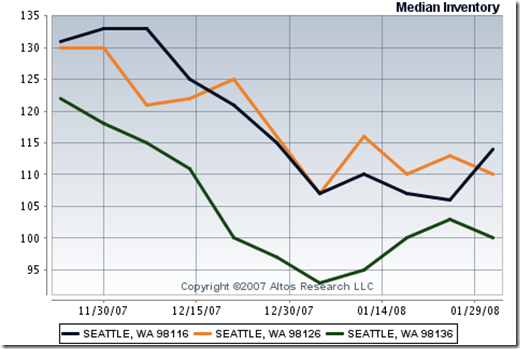 Taking a look at these two charts we get a glimpse of our market here in West Seattle (98116, 98126, 98136). Real Estate is a Supply and Demand game. With an average of 10+ months of "Supply" on the market. Pricing and Condition is key to selling your home. Location is definitely also a factor look at 98126. Why are the number of sold listings rising there and dropping in 98116 and 98136. Speculation leads us to the High Point Development. With all those brand new homes and the builders ability to lower the prices more than your average cash strapped home owner, thats where the action is. For the rest of us homeowners, Buyers are waiting out the Real Estate frenzy of the news media. Closings tend to lag the real decision process by about 30-45 days. These numbers really reflect the buyers of December rather than the buyers of January and February.